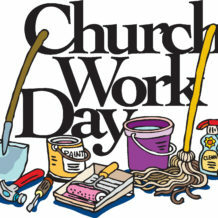 BMUMC TRUSTEES will be hosting a Church Work Day on April 14th from 8 am – Noon. This will give you the opportunity to help keep your Church and Education Building in clean, good working condition. There will be a variety of projects to work on. All are welcome to join in the fun. No experience required ~ all levels of experience needed.